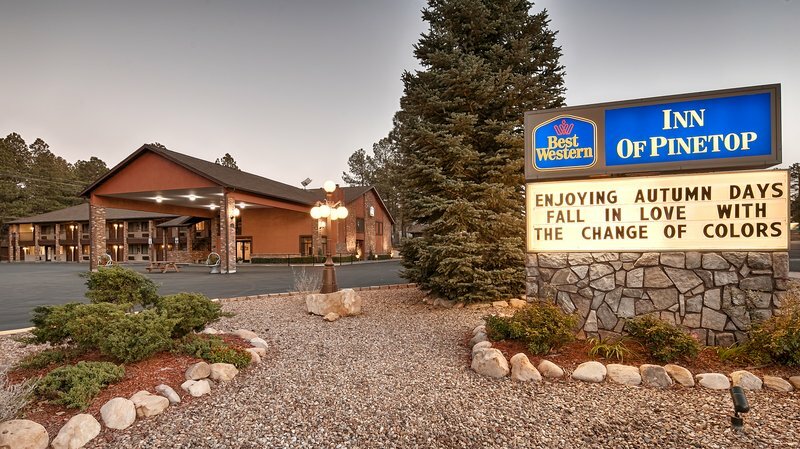 Check Rates & Availability at BEST WESTERN Inn Of Pinetop! People come from around the country to take on the powder at Sunrise Ski Resort, and our Pinetop hotel provides the perfect accommodations for a fantastic vacation. Pinetop, AZ, features the best of the great outdoors throughout the year. Skiing at Sunrise Ski Resort is a favorite recreational activity, but boating, fishing and hiking are the activities of choice during the summer months. Golfing is also popular, and there are many courses throughout the region for guests to practice their swing. Getting outdoors is a way of life around here. The Winter Games and Dog Sled Races provide plenty of cold weather entertainment, while the annual Run to the Pines Car Show attracts luxury, exotic and collector car owners from around the nation. Hunting season is something everyone in the region waits for, and the annual Pow Wow brings together Native tribes from around the state. Our Pinetop hotel is near a lot of restaurants, and were located in the heart of Pinetop close to fishing spots. Theres a great hiking trail just 500 feet from the hotel, and all guests are surrounded by a relaxing environment. Beautiful pine tree views and a number of golf courses provide the backdrop for our hotel. We also welcome a number of business travelers to our Pinetop hotel, including guests in town for work with Safeway, Circle K, Arizona Fish and Game and Indian Health Services. No matter why youre visiting Pinetop, whether for work, skiing or exploring, beat the Phoenix heat and enjoy spacious accommodations in a quiet, relaxing environment. At this hotel, we understand that you need to rejuvenate and feel right at home. Book your upcoming, well-appointed room at Best Western Inn of Pinetop, where guests get a great value! Enjoy your stay. From: Highway 260. The Best Western Inn of Pinetop is located on Highway 260 in Pinetop, half a mile east of the Safeway shopping center. 0.75 mile(s) from Salt Restaurant/Wine Bar, full service, American, open for: dinner. Open Tuesday thru Saturday. Happy Hour from 5 p.m. to 6 p.m. Exceptional cuisine and service with bistro style setting. Live Jazz Band on Wednesday evenings. 1.00 mile(s) from Sakura Buffet, buffet, Chinese, open for: lunch, dinner. Truly amazing food with plenty of choices! 1.00 mile(s) from Lotus Garden, full service, Chinese, open for: dinner. 2.50 mile(s) from The Pasta House, full service, Italian, open for: dinner. 2.00 mile(s) from Red Devil Pizza, full service, American, open for: lunch. You can't beat their pizza and their outstanding service! 1.00 mile(s) from El Rancho Restaurant, full service, Mexican, open for: lunch, dinner. 1.00 mile(s) from Charlie Clark's Steakhouse, full service, Steak House, open for: lunch, dinner. Historic local favorite steakhouse. A mountain tradition since 1938! 0.50 mile(s) from Chalet Restaurant & Bar, bar/lounge, Seafood, open for: dinner. For the best seafood in town! Also includes Sharky's Sushi Bar. 0.25 mile(s) from Darbi's Cafe, cafe, American, open for: breakfast, lunch, dinner. The best breakfast and lunch on the Mountain! Now serving dinners until 8 p.m. Wednesday thru Saturday! 0.50 mile(s) from Little Caesar's , fast food, American, open for: lunch. Pizza is already waiting on you! Adjacent to Picnic Basket, cafe, American, open for: breakfast, lunch. Great American Food just few steps away from our hotel! Now open seven days a week! 0.50 mile(s) from Johnnie D's Pizzeria, full service, Italian, open for: dinner. Offers tasty pizza, pasta and salads and also has free delivery. Located next to Pinetop Brewery and Stolen Recipe Bar-Be-Que. 1.00 mile(s) from Los Corrales, full service, Mexican, open for: lunch. The best Mexican restaurant in town! Great food and great service! This is the place to dine! 2.00 mile(s) from The Lion's Den Bar & Grill, bar/lounge, American, open for: lunch, dinner. Open seven days a week for lunch and dinner. Live music on the weekends. Garden - 1.00 mile(s) from Lotus Garden, full service, Chinese, open for: dinner. Gym - Complimentary access to The Gym - located within 1 mile of hotel. Two 24-hour access keys available at front desk after business hours.